Local damage to skeletal muscles can happen due to injuries and accidents. If the damage is severe, normal muscular functioning and central nervous system may be permanently damaged. Spasticity is a condition characterized by sustained contractions of the muscle. It is due to the loss of nerves responsible for maintenance of balance in corresponding muscle activities. A disturbance to the normal flow of information in the CNS caused by diseases, infections, toxins, and injuries can lead to disturbances ranging from spasms to paralysis. Muscle spasm results from violent and painful involuntary muscle contraction usually caused by muscle overstretching, joint wrenching, and tendon or ligament tearing. When this happens, the injured area floods sensory impulses to the spinal cord and it responds by eliciting intense muscle contraction. Pain from muscle spasms is due to lactic acid accumulation that occurs when blood flow is cut off during contractions. Sensory impulses continue to flood and a vicious cycle of contraction develops. Muscle spasticity occurs when damaged neurons are within the CNS rather than the peripheral areas. The site of damage makes this abnormality permanent. There is an interruption in the balance of excitatory and inhibitory influences within the CNS which can lead to hypertonia (excessive muscle stimulation) and consequent contractures and structural changes. There is now loss of coordinated muscle activity. Centrally acting muscle relaxants work in the CNS to interfere with reflexes that cause muscle spasms. They essentially destroy or lyse spasms and are often referred to as spasmolytics. Other modalities of spasm and pain relief like rest, heat application, and physical therapy are used in addition to these drugs. The exact mechanism of action of skeletal muscle relaxants is not fully understood but it is thought that it involves the participation of upper or spinal interneurons. It inhibits monosynaptic and polysynaptic spinal reflexes. Other than that, it is a CNS depressant. Primary indication is relief of discomfort associated with acute, painful musculoskeletal conditions as adjunct to rest, physical therapy, and other measures. Alleviation of signs and symptoms of spasticity, may be of use in spinal cord injuries or spinal cord diseases. Safety and effectiveness not established in children. However, children older than age 12 may be given with metaxalone. Baclofen, on the other hand, is used to relieve spasticity associated with cerebral palsy. Methocarbamol is the drug of choice for children with tetanus. Children should be monitored closely for CNS and GI toxicity. They should be cautioned to avoid activities that require alertness (e.g. driving) because drugs can cause confusion and drowsiness. Muscle spasm in adults related to anxiety can be treated with diazepam. Pregnant and lactating women should be advised to use contraception and alternative method of feeding, respectively. They are more likely to experience adverse effects associated with these drugs. Carisoprodol is the centrally acting skeletal muscle relaxant of choice for older patients and for those with hepatic or renal impairment. Allergy to centrally acting skeletal muscle relaxants. Prevent hypersensitivity reactions. Skeletal muscle spasms caused by rheumatic disorders. Do not benefit from these drugs. History of epilepsy. CNS depression and imbalance caused by drugs may exacerbate seizure disorder. Cardiac dysfunction. Muscle function may be depressed. Condition marked by muscle weakness. Can be exacerbated by drugs. Hepatic, renal dysfunction. Interfere with drug metabolism and excretion. Baclofen is not indicated for treatment of spasticity that contributes to locomotion, upright function, or increased function. Blocking this spasticity results in loss of these functions. CNS: depression, drowsiness, fatigue, weakness, confusion, headache, insomnia. GI: nausea, dry mouth, anorexia, constipation. Chlorzoxazone may turn urine into purple-red color. Tizanidine has been associated with liver toxicity and hypotension in some patients. Baclofen is tapered over 1-2 weeks to prevent development of psychoses and hallucinations. Assess for mentioned contraindications and cautions (e.g. drug allergy, cardiac depression, rheumatic disorder, pregnancy and lactation, etc.) to prevent untoward complications. Conduct thorough physical assessment (temperature, skin color and lesion, CNS orientation, affect, reflexes, bilateral grip strength, spasticity evaluation; bowel sounds and urine output) to obtain baseline data. Monitor liver and renal function tests to detect potential adverse effects. Provide additional spasm and pain relief like rest periods, heat application, NSAIDs as ordered, and positioning to augment the effects of the drug at relieving the musculoskeletal discomfort. Discontinue drug at any sign of liver and renal dysfunction to prevent severe toxicity. Monitor respiratory status to evaluate adverse effects and arrange for appropriate dose adjustment or discontinuation of the drug. Provide comfort measures to help patient tolerate drug effects. Monitor patient response to therapy (improvement in muscle spasm and relief of pain; improvement in muscle spasticity). Monitor for adverse effects (e.g.CNS changes, GI depression, urinary urgency, etc). Direct-acting skeletal muscle relaxants enter the muscle to prevent muscle contraction directly. Dantrolene acts within skeletal muscle fibers and interfere with calcium ion release from the muscle tubules. Therefore, the fibers are prevented from contracting. It does not interfere with neuromuscular transmission and does not affect skeletal muscle surface membrane. Safety and effectiveness not established in children. Dantrolene is used to treat upper motor neuron spasticity in children. Dose should be accurately calculated based on body weight and it increases over time. Children are at increased risk of CNS and GI toxicity. Premenopausal women are at increased risk for hepatotoxicity in association with use of dantrolene. Older women who are receiving hormone replacement therapy have the same risk for hepatotoxicity with premenopausal women in association with use of dantrolene. Assess area before administering botulinum toxins because area with active infection will be exacerbated by injection. Monitor intravenous access sites of dantrolene for potential extravasation because drug is alkaline and very irritating to tissues. Periodically discontinue dantrolene for 2-4 days as ordered to monitor therapeutic effectiveness. Discontinue drug at any sign of liver dysfunction to prevent adverse effects. Monitor patient response to therapy (improvement in spasticity, movement and activities). Monitor for adverse effects (e.g. CNS changes, diarrhea, liver toxicity, etc). Quiz time! 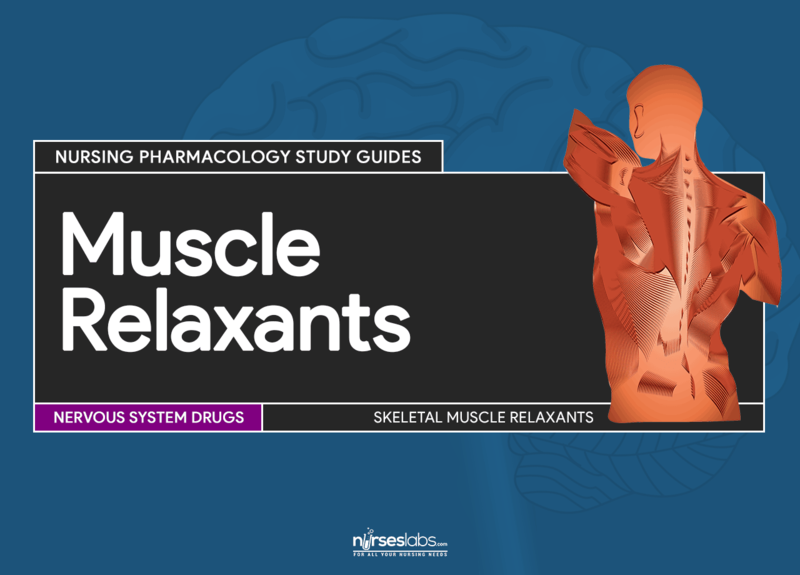 Let’s see what you’ve learned from this pharmacology guide for muscle relaxants. Take this 5-item quiz! Botulinum toxin type A (Botox Cosmetic), botulinum toxin type B (Myobloc), and dantrolene (Dantrium) are all direct-acting skeletal muscle relaxants. Which of the following is the priority nursing intervention for children receiving muscle relaxants? Assess bowel sounds and activity. Children are especially at an increased risk of CNS and GI toxicity. What is the centrally acting muscle relaxant of choice for children with tetanus? Both botulinum toxin type B and Dantrium are direct-acting skeletal muscle relaxants. Baclofen is indicated for relief of spasticity in children with cerebral palsy. How long should Baclofen be tapered to prevent development of psychoses and hallucinations? A patient who had a dose of botulinum toxin type A complained of headache and dizziness. What is the most appropriate nursing response? 2. Which of the following is the priority nursing intervention for children receiving muscle relaxants? A. Assess bowel sounds and activity. C. Administer drug with food. 3. What is the centrally acting muscle relaxant of choice for children with tetanus? 4. How long should Baclofen be tapered to prevent development of psychoses and hallucinations? 5. A patient who had a dose of botulinum toxin type A complained of headache and dizziness. What is the most appropriate nursing response? 2. Answer: A. Assess bowel sounds and activity. 5. Answer: C. Assess for possible anaphylactic reactions.